When you think of a roasted vegetable recipe you don't usually think of the cruciferous vegetables, like broccoli, Brussel sprouts, or cauliflower. Yet this may be the easiest and tastiest way to make them! When you roast vegetables you don't use water which means you are not only retaining nutrients but you're concentrating the flavors. 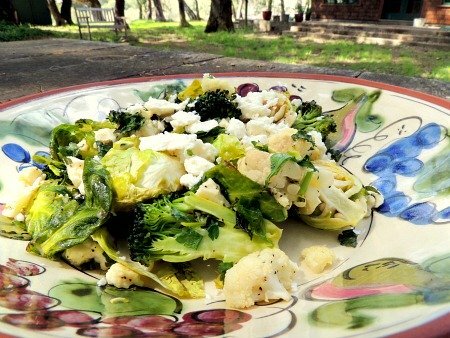 The cruciferous vegetables below take far less cooking and are especially good with the feta cheese. Put all the vegetables in a bowl with olive oil and sprinkle with salt and pepper. Spread in 1 layer in a 13 1/2" x 9" baking dish. Roast in the oven for 15 - 20 minutes. Test with a fork and when they are tender they are done. Sprinkle with the feta cheese and parsley while they are still hot. These vegetables taste good at room temperature or when they are hot right out of the oven. Serve with a main entrée or the vegetable dish by itself with some quinoa or barley and a green salad. It makes good nutrition sense to add broccoli and any of the cruciferous vegetables (cauliflower, Brussels sprouts, cabbage, kale and many more) to your diet whenever possible and this recipe is especially simple. They contain an anti-cancer compound called sulforaphane and other vital phytochemicals that support your hormone balance and help to lower cholesterol. Roasting them is an easy, different way to prepare them. Sweet potatoes and yams are the low glycemic root vegetables. What's great about that is they feel and taste as filling as a white potato but they are not as starchy. They really are more closely related to winter squashes but unlike squashes don't raise your blood sugar. This makes them a perfect food for the low glycemic plan. The idea with this roasted vegetable recipe is to add a few more vegetables and mix it up a little. Heat the oven to 375 degrees. Serves 4. 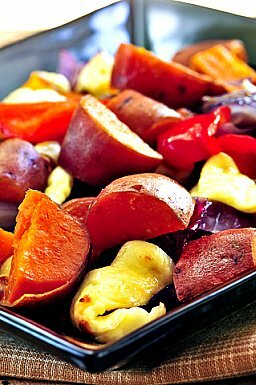 Place the sweet potatoes or yams in a 13 1/2" x 9" baking dish and add the olive oil, salt and pepper. Put in the oven and cook for about 30 minutes. Add the red bell pepper and the whole mushrooms which have been carefully rinsed and dried. Add a little more oil if necessary to make sure the mushrooms and bell pepper are coated. Stir in with the sweet potatoes and cook for another 10 minutes. Serve hot from the oven. This roasted vegetable recipe varies only in cooking time and a few ingredients. Either recipe can be put together quickly. Roasting is one of the most nutritious ways you can prepare vegetables other than eating them raw or steaming. Roasting vegetables is perfect for a wintry evening for just yourself and your partner, for a family meal or it can lend drama to a holiday dinner party. There's something about the roasting that really brings out the different flavors of each vegetable. These recipes are available as printable low glycemic index recipes. Return from Roasted Vegetable Recipe to Low Glycemic Recipes. Return from Roasted Vegetable Recipe to Lifetime Fat Loss home page.